We have already reviewed two Audiosophia integrated amps, the smaller I-40R and the bigger I 50 jm. This Italian firm also offers three entry-level loudpeakers: this J1, the bigger J2 (still a bookshelf) and the floorstander J3. Being always intrigued by entry-level gear, because this makes HiFi affordable for a wider public, I asked the smaller J1 model for a test here on TNT-Audio. The Audiosophia J1 is a compact 2-way reflex-loaded loudspeaker, measuring 30.8 cm (H) x 15.5 cm (width) x 20 cm (depth). It makes use of a damped cellulose 130 mm (5") woofer - loaded with a rear-firing reflex port - and a 19mm (0.75") silk-dome tweeter. Apparently, these drivers are Chinese stuff and so appears to be the rest of the loudspeaker. 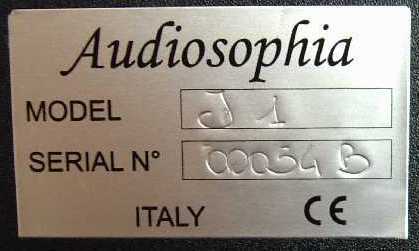 As it happened with the I-40R integrated amplifier, a necessary "Made in Italy" label is lacking. All you can find in the rear is "CE Italy", which means that the product should comply with the CE safety regulations. The rear panel hosts the reflex port and the binding posts, that allow just pure and simple monowiring. Nonetheless, they accept bare wire, forks and bananas. This is quite strange, since CE rules don't allow the use of bananas! The cabinet has very nice looks and a good level of finish, considering it doesn't use real wood veneer. The almost diamond-shaped form of the front baffle makes it look like a small Avalon or Diapason Adamantes. The cabinet is made out of medium density fiberboard, of reasonable thickness, or so it seems looking at the front and the rear panels. The inside of the cabinet is filled with sound-absorbing stuff (wool-like, see pic). 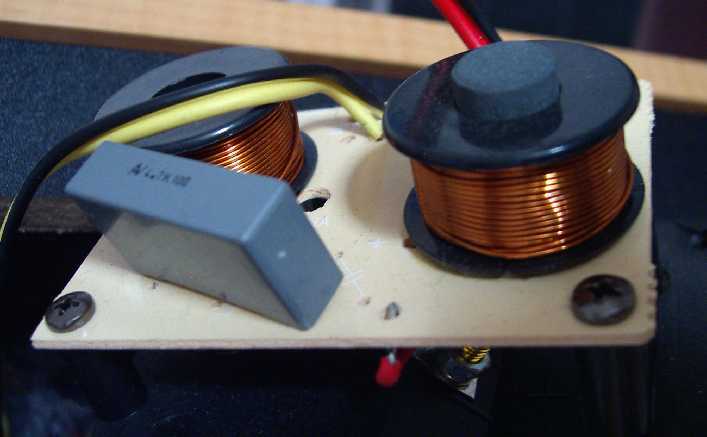 The extremely simple crossover uses two coils (one with ferrite core) and a cap. Internal wiring is as cheap as it can be, with classic figure-8 1.5 mm2 wires, connected to the drivers via fast-ons spades. The silk tweeter has a double magnet while the woofer isn't of the shielded kind. The woofer dustcap is surprisingly soft. The basket of the bass driver is paper thin and is secured to the front baffle via 6 torx screws. More seriously, I've had the possibility to use them with the Audiosophia I40R integrated amp and with a pletora of other amps (Trends Audio TA 10.1, NuForce P-9 and REF9 SE V2, a Chinese EL34 tube amp etc). 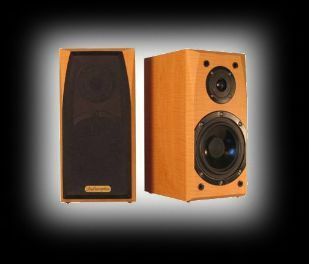 I've also compared them to the Norh 4.0 loudspeakers I reviewed back in 2000, which are exactly in the same price range (and size, too). These loudspeakers have a mostly neutral tonal balance, with good bass and adequate mid-high range. The highest range has a certain gentle roll-off that doesn't hurt. Bass response is claimed to reach 48 Hz (not clear at which -dB) but my ears tell me their -3dB point is closer to 60 Hz instead. Even sensitivity appears a bit optmistic, at 89 dB/w/m. Perhaps it is nearer to 87. The bass is reasonably articulated and powerful, though you shouldn't expect that it will shake your floor. Compared to the bass of the Norh 4.0's, which use a similarly-sized woofer, the J1's bass range sounds a bit richer, though not as precise and clean. 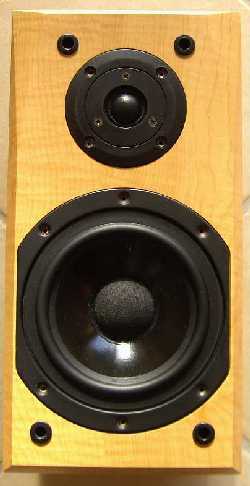 Perhaps the standard-shaped cabinet doesn't help controlling resonancies as the "drum"-shaped cabinet of the 4.0's does. In any case, their performance is close. In the mid range, especially with vocals, the Norh 4.0 are clearly better. Male voices, for example, appear thicker and full-bodied while they sound thinner on the J1's. Transparency and cleanness are on the same level though I'd have preferred more "presence effect" in the mid range of the J1's. In the high range the Norh 4.0 are a bit more realistic, precise and richer in harmonic content, the J1's performance is close...but not there. Overall, at a not careful first listening test and comparison, the two loudspeakers sound similar. At a more careful investigation one notices the pros and cons of each speaker. Summarizing, the bass of the J1 is more powerful (and extended) than that of the 4.0's. It is a bit less precise, though. The mid range has a better presence effect on the 4.0 and the highs appear a bit more realistic. We shouldn't forget the 4.0 uses high-quality Vifa drivers, installed into a bomb-proof resonance-free cabinet. They can sound quite loud but overall dynamics is limited as there are physics laws that even HiFi designers haven't been able to modify. Only marketing men can do that! The J1's are quite lively, even at low listening levels, though their sound is nowhere near to a Klipsch bookshelf, for example. Hence, snare-drum attacks are slower and less lively than they should be, though the kick drum isn't all that bad. At high listening levels there is some trace of extra compression, too, which is normal, considering the size of the midwoofer. In comparison, the Norh 4.0 doesn't perform any better. Actually, it sounds a bit more lazier. The J1's have a slightly bi-dimensional soundstage, in the sense that they lack a bit of depth. Everything happens in front of the listener and the virtual image doesn't expand behind the speakers. Here the comparison with the Norh 4.0 becomes harder for the J1's as the 4.0's performance is still stunning (yes, even after all these years!) both in terms of width and depth of the stage. They simply disappear! The J1's performance is better in terms of height of the stage, which appears to be just acceptable. Indeed, one of my complaints about the stage of the 4.0's was its limited height. The 4.0's perform better even in the "focus & precision" department, with clearer contours and more stable displacement of instruments and singers. The usual customer of this kind of speakers is not concerned with 3D soundstaging, though. Putting the speakers on a desk or over a bookshelf will immediately destroy any virtual stage. 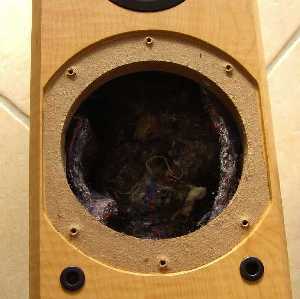 Like any other loudspeaker a reasonable amount of "break-in" is needed before listening. In my opinion, 50 hours are enough, if played relatively loud. After this workout the woofer reacts faster and the tweeter sounds sweeter. These are bookshelf loudspeakers but the rear-firing reflex port suggests to keep them 10/15 cm far from the rear wall, at least. Placed this way, of course, the speakers can't deliver all their performance so it is way better to use a speaker stand so that the tweeter is almost aligned to your ears, when seated in your listening position. There's no need to spend huge amounts of money on speaker stands. Some easy DIYing (see our free designs) should be taken into serious consideration. Otherwise try browsing the net for second-hand cheap speaker stands. Atacama makes some good and inexpensive stands, too. These speakers, considering their price range, are nicely built. Only at a closer inspection you can detect minor flaws. At a first glance they may appear a sophisticated high-end minimonitor. WAF scores pretty high, indeed. The speakers lack any kind of "feet". Hence, to avoid scratches, you need to add your own damping/rubber feet or spikes. Avoid threaded spikes as the J1's don't have threaded holes. I've encountered some difficulty with different banana plugs, as the diameter of the binding posts seems slightly smaller than usual. Their price isn't low, considering what one can find nowadays on the market. Chinese (non-rebranded) loudspeakers might cost a fraction of the J1 price and offer even more. Considering they don't seem to be really "Made in Italy" I wonder why one should pay for more. Which is the "added value"? The Norh 4.0 offer better drivers, a more sophisticated craftsmanship, a FAR BETTER wood-carved cabinet and are sold for 400 USD (that's 253 € nowadays!) shipping worldwide included. Sound. A bit thin in the midrange, harmonically poor in the highs, with bi-dimensional soundstaging. The Audiosophia J1's have a better quality/price ratio than their "partner" amplifier, the I40R. Yet, they appear still a bit overpriced, considering what's offering the competition. Without searching for mostly unknown Chinese manufacturers which sell good things for peanuts, one can easily find the Norh 4.0 speakers that offer a far better value for money. Now, I could understand and justify the price difference if the speakers were actually "Made in Italy"...but they don't appear so. Selling these speakers abroad, with shipping charges and considering the strenght of the Euro is almost impossible. They could be sold within the EU as they look cool and sound good. They don't perform stunningly well in any area but they aren't clearly flawed.